This Get the Look is dedicated to those looking for some pastel living room ideas and décor, inspired by pieces shown at this year's fantastic designjunction. This year's designjunction was brilliant, with exhibitioners coming out with some truly phenomenal pieces. We were impressed by simple, calming designs and pastel colours that are firmly back into fashion. This Get the Look is dedicated to all those loving the latter type of designs, so here we come with some pastel living room ideas and décor for you. The main focus is minimalistic simplicity: cream painted walls, ceramic pendant white light shed, a simple round wall mirror. The Norman Copenhagen Tablo Table By Nicholai Wiig gives a touch of simplicity too. Funky enough to give the room more of a personality, but not loud enough to disrupt the minimalistic pastel nature of the room. Pair it up with Oona carpet in rose, incredibly delicate and stylish. Next step is sprinkling the room with accessories: the geometric candle holder from Tiipoi, the lovely Orb moneybank from Dowse or the vaguely nostalgic caravan artwork by Hey Studio for walls. Finish the room all off with a couple of our 1960's inspired Cocktail Chairs, Emilia. 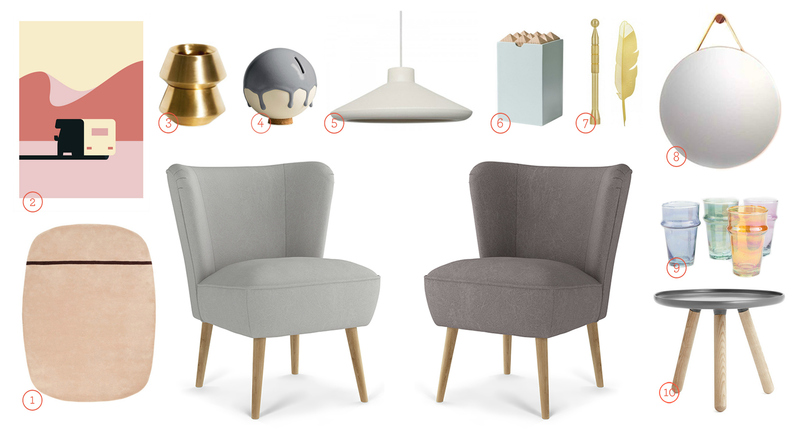 Available in a variety of pastel colours (shown here in Stonewash - Cool Slate (right) & Stonewash - Wolf (left), these chairs truly bring the room to life. Sit back, relax, and bask in in your gorgeous pastel furniture. You've earned it. Design Tip: Pastels and quirky design was a running theme this year.